Former MVP Derrick Rose, Chicago's hometown hero, was shipped to New York in a multiplayer swap, bringing center Robin Lopez, guard Jose Calderon and guard Jerian Grant to the Windy City. Now 27 years old, the 6-foot-3 point guard hasn't resembled his old self in years, with injury after injury sapping most of his explosiveness, elite quickness and leaping ability. Drafted No. 1 overall in 2008, Rose quickly rose through the NBA ranks, averaging 25.0 PPG and 7.7 APG as he led the Bulls to a 62-20 record. He would only play 100 games over the next four seasons. Knicks coach Jeff Hornacek, who has been campaigning to add an experienced point guard, now has two heavy lifters at his disposal in Rose and Carmelo Anthony. With Latvian sensation Kristaps Porzingis and a free agent or two in tow, the Knicks will look to rebound from a disappointing 32-50 season. It is by the way rumored that Rose is recruiting former Bulls teammate Joakim Noah. With at least $30 million to spend this summer, the Knicks will without a doubt explore a number of options, including Noah and Houston's Dwight Howard. 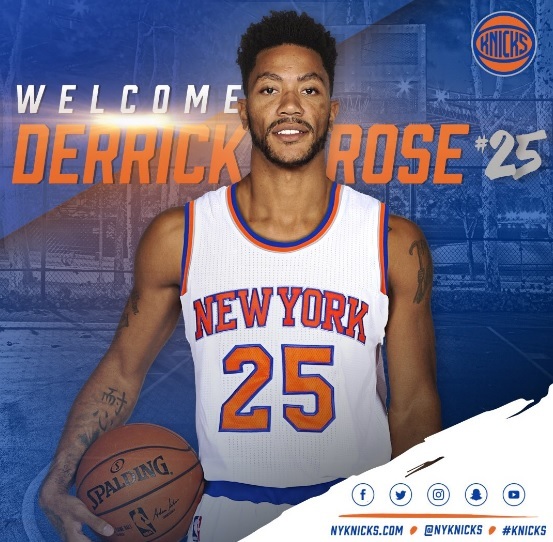 Rose is owed $21.3 million in the final year of his contract.